New details emerge of Thai cave rescue. File photo: members of the Royal Thai Navy are pictured with the 12 schoolboys, members of a local soccer team, and their coach, who were trapped in the Tham Luang Cave network in Northern Thailand. TWO BRITISH DIVERS who helped rescue a Thai youth football team from a flooded cave had earlier saved four adults also stranded in the complex, according to a new report on the mission that gripped the world. 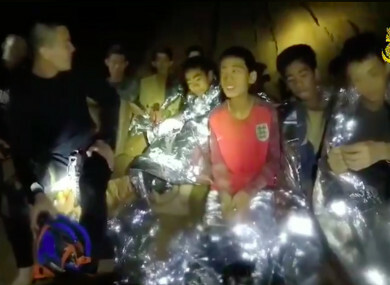 The 12 boys and their coach from the Wild Boars club were trapped by rising waters as they explored the zig-zagging passages of the Tham Luang cave in northern Thailand on June 23. Officials leading the rescue effort called on the expertise of the world’s small caving community, who formed a diving dream team led by Thai Navy SEALs. On the ninth-day of a nail-biting rescue, British divers Rick Stanton and John Volanthen found the youth group dishevelled and thin on a muddy bank, where they had survived on rainwater dripping from rocks. They were pulled out a week later in a three-day extraction, during which the boys were sedated and carried to the cave entrance. But days earlier, it emerged, the Britons unexpectedly found four Thais who, unbeknown to rescuers, had themselves become trapped by flood water while trying to find the children. Droves of well-meaning volunteers and local residents had poured into the area near the border with Laos and Myanmar to try to help. Speaking this week at a “Hidden Earth” cave-community event in the UK, Stanton said he and Volanthen accidentally encountered the quartet of Thai water company workers on June 28. They had been trapped for around 24 hours and their situation was desperate, according to the caving news website Darkness Below in an article summarising Stanton’s presentation. Muddy water was “churning, swirling and eddying around them”, it said, and the water level was rising. But Stanton and Volanthen had only their personal breathing equipment with them. They solved the problem through a staggered approach. First the two Britons dived back through the flooded passageway to reach the next level of dry ground en route to the cave entrance. Then one of took off his gear. The other one swam back to the Thais with the breathing equipment, to bring them out one at a time. This exposed the waiting diver to possible drowning had the area flooded suddenly. But despite a brief technical glitch with the gear, all made it out safely, the article said. The details were not released at the time to the hordes of media that had descended on the site. But the tricky scenario foreshadowed concerns about the later rescue of the boys, who were not experienced divers, prompting fears they could panic. “It’s one of the most remarkable aspects of this whole event that such an amazing thing was a mere sideshow that never even made the press,” Les Williams, chairman of the British Caving Association, was quoted as saying about the rescue of the four adults. Details of the incident are still captivating the public, prompting books and film treatments in a scramble to cash in on the saga. Interest has been further fuelled by a lawsuit against tech billionaire Elon Musk brought by a different British caver who lives in Thailand. Musk has called the caver, who was integral to the rescue because of his knowledge of Tham Luang, a “pedo” on his Twitter account. He gave no evidence to support the allegation. The billionaire’s offer to help with the rescue had been rebuffed as impractical by authorities as well as by expert divers, including the caver in question. Email “Four adults were secretly rescued during 'Wild Boars' cave operation, divers reveal”. Feedback on “Four adults were secretly rescued during 'Wild Boars' cave operation, divers reveal”.